Are you an innovation change leader? 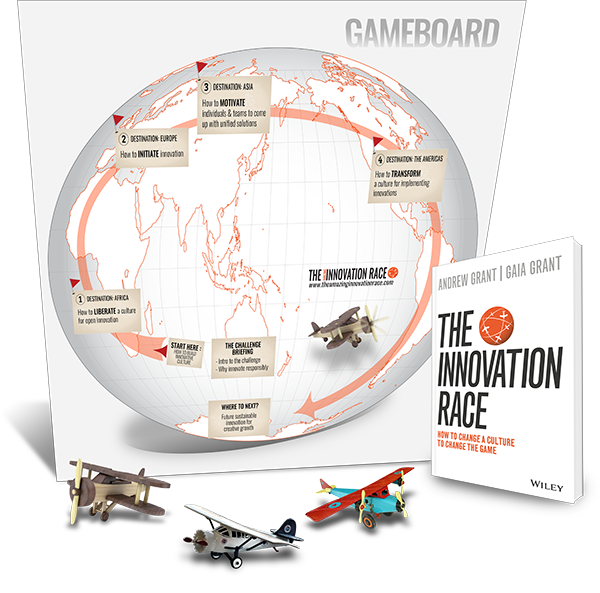 The Innovation Race website introduces a suite of unique learning experiences and resources designed to develop innovative change leaders and organizations. — Discover here how to build a sustainable innovation culture through going ‘deeper than design thinking’. Takes readers on a lively global adventure to explore the state of innovation and to investigate why some countries, cultures and companies race ahead while others struggle. Outlines how it is possible to navigate the key paradoxical challenges that can either frustrate or fuel innovation – and how to develop a sustainable purpose-driven innovation culture to change the game. An engaging around-the-world race challenge with multiple case studies to explore the roots and future of how to create a culture that supports innovation (uses gamification to explore culture change paradoxes and principles). An interactive workshop that helps leaders reflect on their own leadership style, and how this impacts their culture. Assessing the current state and action plans for transitioning to a desired state. In the process leaders learn how to change a culture to learn what sort of climate fosters or impedes innovation. Gaia Grant's PhD research at Sydney University Business School focuses on using the paradox theory to understand how to create a culture for innovation., along with how to ensure this culture is values based and purpose-driven. An organizational assessment that measures preparedness for change and readiness for growth. Identifies the paradoxical positions that indicate whether an organization is prepared for innovation and growth. An individual leadership profile questionnaire to help identify readiness and preparedness to lead a culture of innovation.